According to Budgen’s post, society is led to believe diseases like cancer come from genetics, and we are fed misinformation from the medical industry. Budgen claimed diseases like cancer are actually “survival mechanisms” the body creates to defend itself from toxins. While it’s great to raise awareness for cancer, factually inaccurate statements like Budgen’s can be incredibly harmful to those undergoing treatment as well as those who are newly diagnosed. According to the National Cancer Institute, cancer is a genetic disease caused by certain changes in the genes that control the way our cells function — especially how they grow and divide. Although diet may play a role, there are many other risk factors such as sunlight, tobacco, hormones, age and other environmental factors. 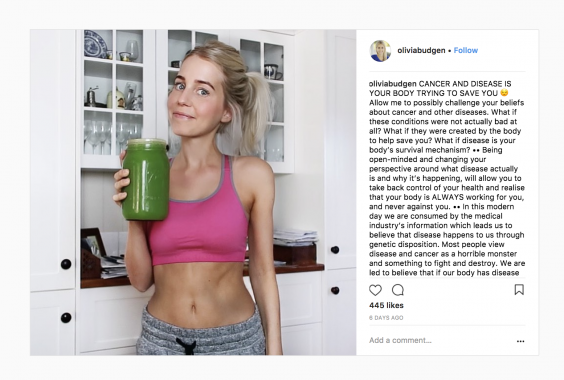 Since posting, Budgen has been compared to Australian blogger Belle Gibson who lied about having cancer in 2009, and said diet could cure the disease. Other Twitter users commented sharing their outrage as well. This is absolutely baffling. She’s actually said she believes ‘disease cannot exist inside of us’ if we live ‘truly healthily in all areas of our lives’. I’m sure that living ‘truly healthily’ includes buying a lot of her products. Both my parents had cancer. Lost my Dad to it! This is utter rubbish! ???? Oh hellfire. Please. As a cancer survivor I beg these beautiful young women (there are a few of them) to science up ASAP. What about tiny children who get cancer? Are they just not trying hard enough, either? Urgh. The smugness knows no bounds. My response video ???????? click on the link in my bio to watch the full version.